Baseball America names their preseason college All-Americans. 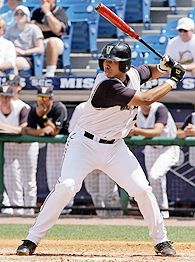 The list includes Vanderbilt’s third baseman Pedro Alvarez. Alvarez has been a first-team All-American and the top hitter on Team USA in each of his first two seasons, and his bat speed and strength make him the best hitter for both average and power in college baseball. His range is limited and his hands are average at best, but he has worked hard on his defense and has enough arm strength for the hot corner. Alvarez is odds-on choice to be the top overall selection in the June draft by the Rays. A third baseman, but many feel he can transition to first base quite well. Hmmmm? July, 2008: Debut at Hudson Valley with a late call-up to Columbus. 2009: Spend season in Vero Beach and Montgomery. 2010: Promoted to Durham for the first half of the year. 2010 also happens to be the last year of Carlos Pena’s extension. Pena traded prior to July 31. Alvarez makes his debut in September, 2010. Anyone think this scenario crossed their minds when they decided to give Pena a three-year deal? Navarro throws well but is only an average receiver. Conditioning is always an issue for him. He hit only .227 with a .286 on-base percentage last season. Luv ya, dog, but I think what you meant was: Alvarez called up in late 2010, plays some 1B, some DH, maybe even a little OF. In the offseason, Pena gets a huge free agent offer and the Rays let him walk, installing Alvarez as their everyday 1B and clean-up hitter beginning in 2011. That was what you meant, right?